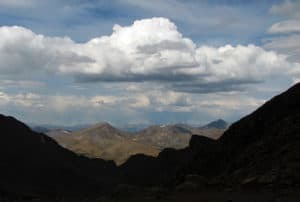 Mount Evans is one of Colorado’s Front Range Fourteeners, and like Pikes Peak, Mt. 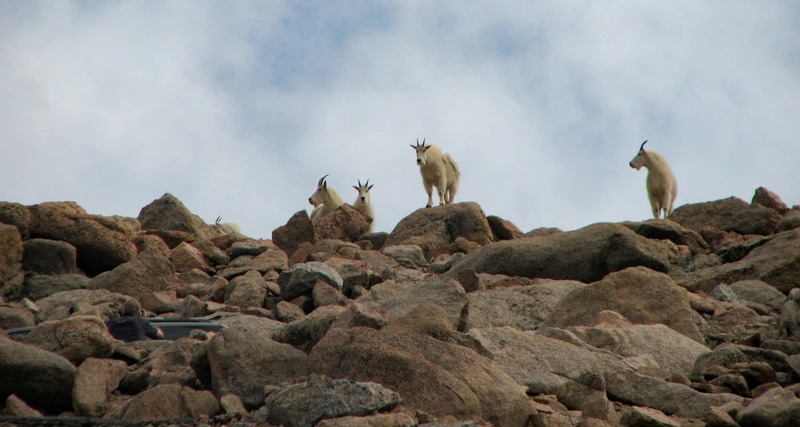 Evans has a road that takes you to a trail just a few hundred feet shy of the summit where you are likely to see both Bighorn Sheep and Mountain Goats. 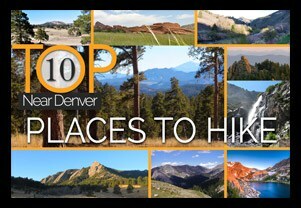 The key to exploring Mount Evans is knowing the stops along the way. View our full trail profile for a suggested itinerary. Explore the full trail profile below for all the details: hiking trails, trail map, and detailed directions to the trailhead. What it lacks in challenge Mt. Evans makes up in breathtaking panoramic views of the Rocky Mountains and opportunities to view wildlife up close. It isn’t much of a hike, because you can summit this 14,265 foot peak in just a few minutes. 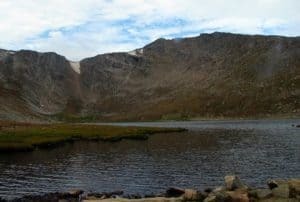 Yet your trip to Mount Evans can include several stops at high mountains lakes, to view wildflowers, and to take in the expansive scenery (See our itinerary below). 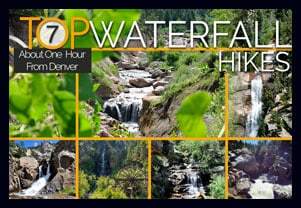 This is one of the best attractions near Denver for visiting friends and family, especially if you don’t have the luxury or equipment to take them into the Colorado backcountry. The views are stunning and there is a good chance that you’ll encounter wildlife that would usually require hours of hiking to see. Still, you are at fourteen thousand feet, so be aware of the effects of altitude, drink plenty of water, and keep an eye on the weather. Finally, the Summit of Mt. Evans. A Better Itinerary? Because weather comes in during the early afternoon, we suggest that you start early, make a short stop at Echo Lake, then drive straight to the summit. On your way down, stop at Summit lake, then make your last stop at the nature center at Mt. Goliath. Do consider altitude. We avoid bringing friends who are not in good health. Be sure to have your guests drink plenty of water, and make sure they have had a day or two to get used to the altitude in the mile-high city. The Weather link below is for Idaho Springs. Weather at the altitude of Echo Lake may be very different, and Weather at the summit will definitely be different. Check this National Weather Service Link for more accurate forecasts. 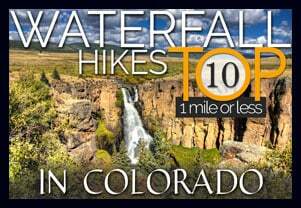 Looking for a more challenging Hike? Try the Chicago Lakes Hike. The trail begins at the Echo Lake Parking Lot.